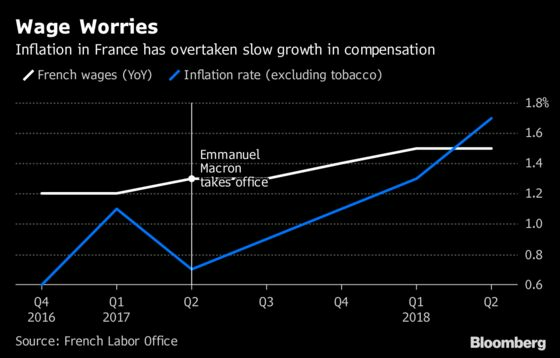 (Bloomberg) -- Emmanuel Macron’s second budget as French president will hammer home an economic strategy that’s becoming increasingly unpopular: make work pay, whatever the cost. His government will on Monday unveil plans for 2019 that include tax cuts for employers and their employees, building on sweeteners granted last year. But to foot the bill and keep the deficit in check, Macron will cap pensions and benefits not linked to work and ax jobs in the public sector. It’s a hard sell for Macron, as implementation of his grand plans has disappointed and he’s little so far to show for his efforts. Opinion polls have plummeted, pensioners are protesting and cuts to welfare have galvanized opposition parties who have dubbed him the president of the rich. Part of the problem now is that he has less room for maneuver. Growth in France has slowed sharply, making it tougher to meet deficit-reduction targets without spending cuts. Meantime, Finance Minister Bruno Le Maire is trying to promote the upside. “My objective is to create French prosperity that is no longer built on public spending but on the prosperity of businesses and creating jobs,” he said on French radio Europe 1 this month. 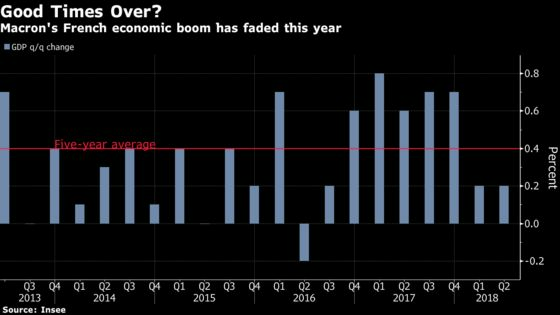 At above 9 percent, unemployment is higher than the euro-area average, and growth in consumer spending power -- a hot button issue for French voters -- has wavered as inflation picks up. That’s left Macron with an approval rating of less than 20 percent. In the 2019 budget, businesses will get a cash boost as Macron transforms a tax credit into a direct cut in payroll taxes. For workers, taxes on overtime will be abolished from September next year, adding to cuts in employee contributions to health and unemployment insurance. But increases in pensions and housing and family benefits will be capped at 0.3 percent, less than one third the 1.4 percent inflation rate the government expects. In the long run, economists are divided on whether Macron’s strategy will channel French people back into work and reduce their dependence on welfare. “It could get results. But real results will come with strong growth and falling unemployment, that’s when you’ll really get a dynamic of work that pays,” said Mathieu Plane, economist at French economic observatory OFCE. By the end of his term in 2022, Macron is aiming to have cut government spending and slashed the debt-to-GDP ratio by 5 percentage points. But after a weaker-than-anticipated first-half expansion, the government has already had to revised up its debt and deficit forecasts this year and next. That means France will skim close to the EU’s 3 percent limit for budget gaps, something that Macron has vowed not to breach.